This is a Wisconsin truck that I picked up with only 115,000 miles on the odometer and a blown engine (the infamous 3VZE, 3.0l V6). A rod broke and punched a hole in the side of the block right behind the A/C compressor. The truck has the DLX trim package and a 5-speed manual transmission. It looks good in this picture but it has rust as you would expect from a 24 year old truck that has spent its entire life in the Milwaukee, Wisconsin area. The body needs attention around the driver’s side cab corner, the leading edge of the hood, the very back of the frame (last 16 inches), the tailgate, the rear bumper and the frame around the front suspension. The running gear needs rust repair too. The back axle needs new brake backing plates and a good de-rusting and re-paint. The front suspension is going to get new control arms and torsion bars. And last, but not least, The engine needs to be replaced. It sounds like a lot of work, but I think on balance there is enough good about this truck to justify saving it. I think this picture supports that proposition. At the beginning of this summer (2017) I decided to get busy with this project. I had this truck sitting around for years. I took a deep breath a jumped in with both feet. I have to say I was pretty happy to get this engine, transmission and transfer case out without leaving a scratch on the truck. 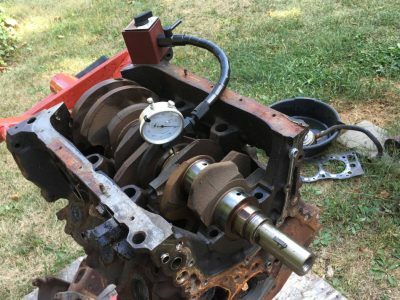 I learned from reading a few posts on the yotatech.com website that a come-along winch attached to the back of the transfer case and to the main lifting point of my engine hoist would let me control the angle of dangle so I could ease it up over the radiator support. It worked like a charm. I separated the engine and transmission, removed the clutch and flywheel, and now the engine is on a stand ready to be disassembled. My biggest hope is that the cylinder heads didn’t get damaged when the bottom end let go. The engine apparently has only 115,000 miles on it and so I am hoping to get what I considered low mileage cylinder heads for my 1989 4runner which has very low compression on two cylinders due to what I believe are burnt exhaust valves. At this point, I’m working with two engines. The engine you see pictured here and another one that I bought at a wrecking yard with high hopes that it can be made into a good working engine. 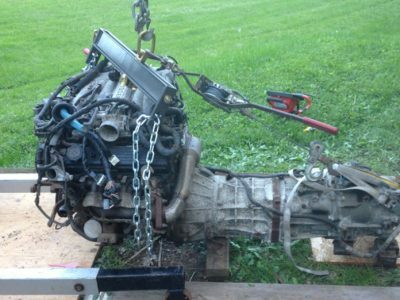 I talked to a couple of wrecking yard operators in my search for a replacement engine. I got two general responses. Either they wanted way to much money or they wouldn’t even bother to pull a 3VZE before sending the truck off to the crusher. 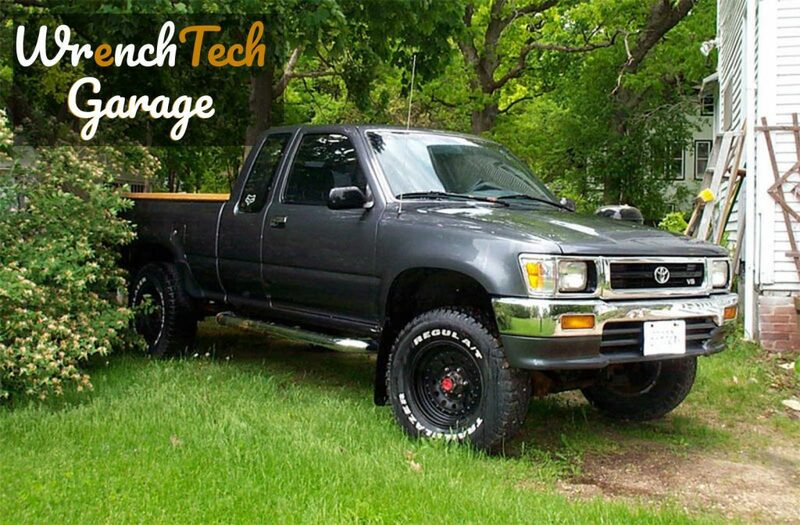 Then I looked up some guys that I had noticed on car-part.com, the Internet automotive salvage website, that seemed to sell a lot of older Toyota 4×4 parts,. They are called Hoops Auto Parts in xxxxx, Wisconsin. 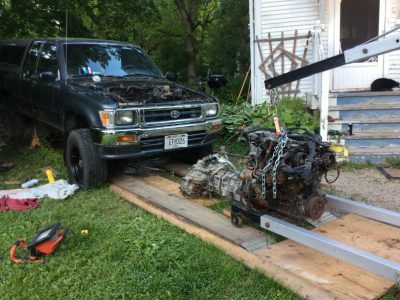 I noticed that they had an engine out of a 1994 4runner that they were offering for sale for $75. I called them and they we’re upfront about telling me that they thought the engine had 170,000 miles on it and probably needed a head gasket. The place was about an hour and a half away from me, but the price seemed right and so I hooked up my 5 x 10 trailer behind my 1989 4runner and went out to pick it up. I worry too much sometimes (okay maybe a little more than just sometimes). I shouldn’t because life has proven that stuff usually works out better than I think it will. The work on this truck is going well and I am finding amazing deals on tools and parts to get the job done. The engine is heavily damaged, with a hole in the side of the block from an exploding connecting rod. I am going to take it apart and see if there are any salvageable parts. I am particularly interested in the cylinder heads. 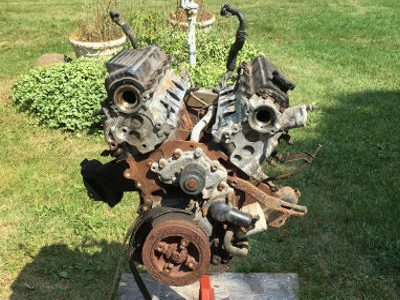 The engine has low mileage, So if the heads are undamaged they might be just what I need for my 1989 4runner. The damage is so extensive that I cannot imagine anything else being salvageable. 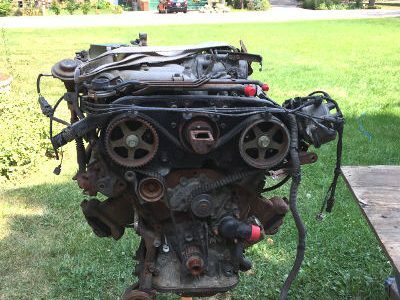 Well, it looks like I am going to get pair of nearly new cylinder heads off of this “junk” engine. Everything seems to check out. The mating surface is flat. The valve guides are as good as new. And most importantly, They do not appear to have sustained any damage from the violence that happened in the rotating assembly. I would not of been surprised if they were junk. Instead I have good, low mileage heads. What a stroke of luck! 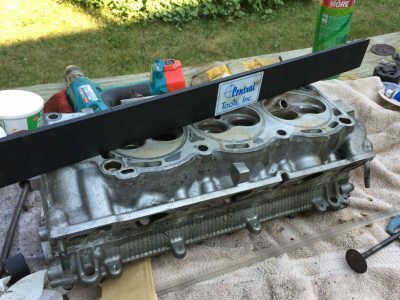 The next step was the disassembly of the remaining short block. This time I was really expecting the worst. Three rods broken, one rod twisted and stretched, a couple of pistons damaged, the main bearing cap assembly broken, a hole in the side of the block, and some holes in the oil pan, all indicate that major destructive forces were at play. Certainly the crankshaft would have taken a hit. Two things to look out for. Did the crankshaft get bent? Did the rod journal get hammered out of round? So far the answer to the first question appears to be that the crankshaft is not bent. In fact, it seems to be well within the factory spec. I haven’t checked the rod journals with a micrometer yet, but judging from the excellent condition of the bearing shells I’m guessing that that is not going to be an issue either. Good words will soon appear here. Wheee! Isn’t this blogging stuff fun? A really awesome picture will soon appear to the left of this writing.